ST. GEORGE – Imagine not being able to provide such basic necessities as clothing, shoes, diapers or even food for your family this holiday season. With poverty increasing in Utah, this is a heartbreaking reality for many. Responding to this need, two local institutions have stepped forward to lend a hand. Dixie State College of Utah has purchased hundreds of gifts, including toys, jackets, shoes and other much-needed items for children from infancy to 12 years of age during DSC’s three-week Angel Christmas Tree program. Several Angel trees were placed throughout the campus and adorned with ornaments specifying ages, genders and gift ideas for several local children. Gifts were delivered to the Dixie Center St. George to be wrapped by volunteers. Students also held their annual White Out Dance, which raised just over $1,200 for the KONY Coins for Kids campaign. DSC representatives Mary Nell Lundquist, Jordon Sharp and Stefanie Higginson presented a check live on-air to KONY radio personalities Carl Lamar and Marty Lane last Monday. Last week, SouthWest Community Credit Union hosted a food drive that enabled them to collect and donate over 200 pounds of food to Dixie Care and Share and Iron County Care and Share. “These organizations were very appreciative for the generosity of our members and employees, especially because it’s the holiday season and families are really stretched,” SouthWest volunteer leader Lisa Orellano said. 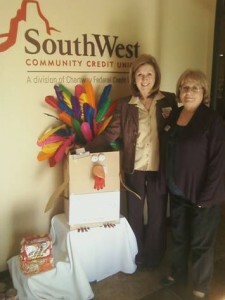 Members of the public and SouthWest employees stopped by the credit union’s branches in Hurricane, St. George and Cedar City to donate canned and boxed food for families benefited by the two charities. The community sincerely opened their hearts for the food drive; support was so great that volunteers had to use a forklift to transport the items.